>Each year, my new friend Paul Lyttle cooks Christmas dinner for his friends who are alone, or don’t have family around. He calls it the “Orphans’ Christmas Dinner”. 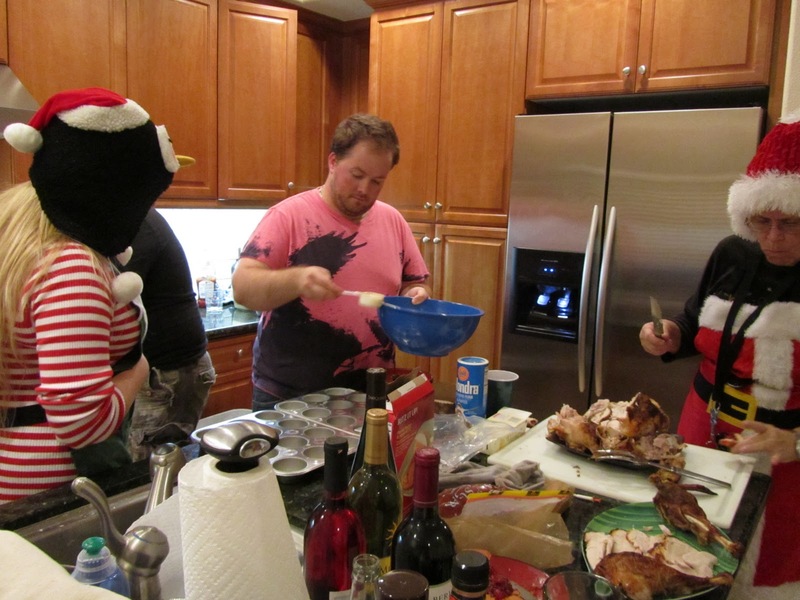 This year, 12 people stopped by and Paul himself cooked the extravaganza with only a little help from everyone else. I just want to be clear that I did nothing except stuff myself full of food. The menu this year as modeled by the lovely Amber who arrived in all her festive Christmas gear — and her mom did too! Each guest was asked to bring stocking stuffers to put into everyone’s stockings and when I arrived, Danni was busy wrapping some of the gifts and placing them into the stockings. I raided the fridge and got myself a beer and Austin and I ate some raspberry turnovers and brie en croute while we waited for the food to be ready. The stove had pots of water boiling with potatoes, carrots, swede (rutabaga), and the smell was incredible. Soon, the turkey was done, carved, gravy, sauces completed and the table was set for the Christmas night feast. There was roast beef with a British style sauce, more like au jus, but a little thicker, but not thick like gravy. My favorite thing to eat with roast beef is Yorkshire pudding and Paul almost didn’t make these but I pleaded and begged and Cory ended up making them. I poured the sauce over the pudding and scarfed down three of them. I was told the Yorkshire pudding is easy to make, and I’ll take their word for it. Maybe, just maybe I’ll try to make some next year. Roasted turkey was so moist and flavorful and Amber’s mom did a fantastic job carving the bird. Being the only Asian at dinner, I had my pick of the dark meat which was very tasty and I went back for seconds and thirds. Lovely thick gravy for the turkey as well as a creamy garlic sauce which Paul made, but for me, the roast beef sauce was what I liked on EVERYTHING! 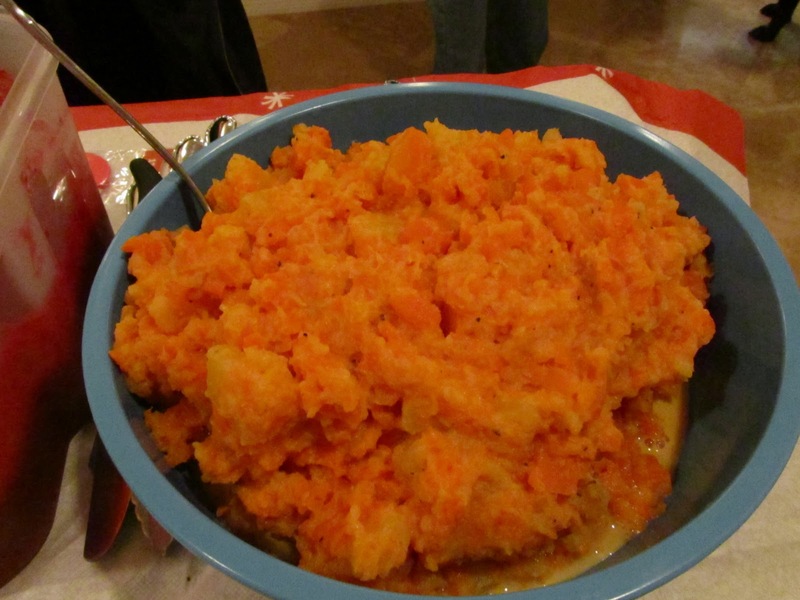 Side dishes included a carrot and swede (rutabaga) mash. I like the mixture because the texture isn’t mushy and had a slightly sweet taste from the carrots but it wasn’t overly sweet. Mashed red potatoes were awesome, I loved how Paul left the skin on. That’s the way I make my mashed potatoes! The gravy made this dish very delicious. Another potato dish was roasted potatoes with garlic, rosemary and thyme — a Gordon Ramsey Christmas dinner recipe. Soft on the inside and crisp on the outside. Parsnip strips are also tasty and it’s nice to have a bunch of different root vegetables to put together a hearty winter meal. Bread stuffing was done two ways. One was traditional, the way I’d make it in a baking dish, while the other one was made into “cakes”. 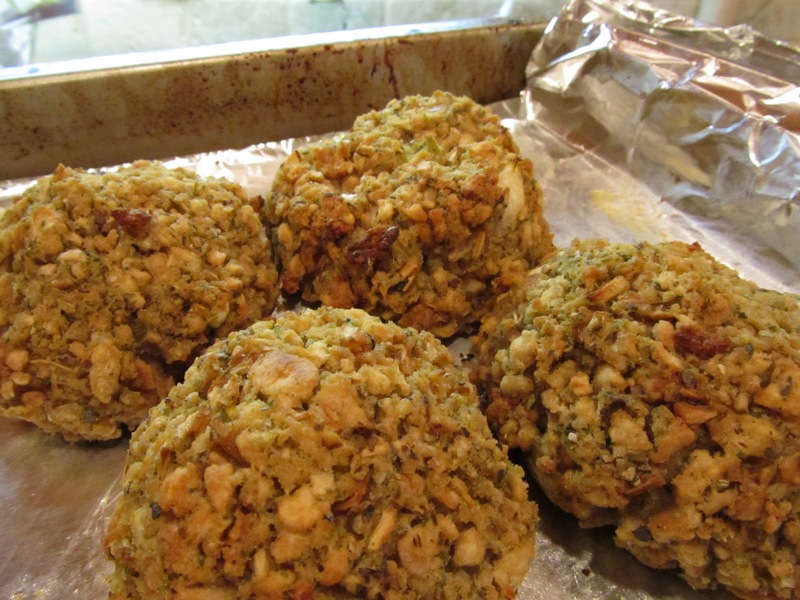 They looked like scones but were just the stuffing mixture made into balls and baked. There were two home made cranberry sauces — which I didn’t taste because I don’t like cranberry sauce, not even when I make it. 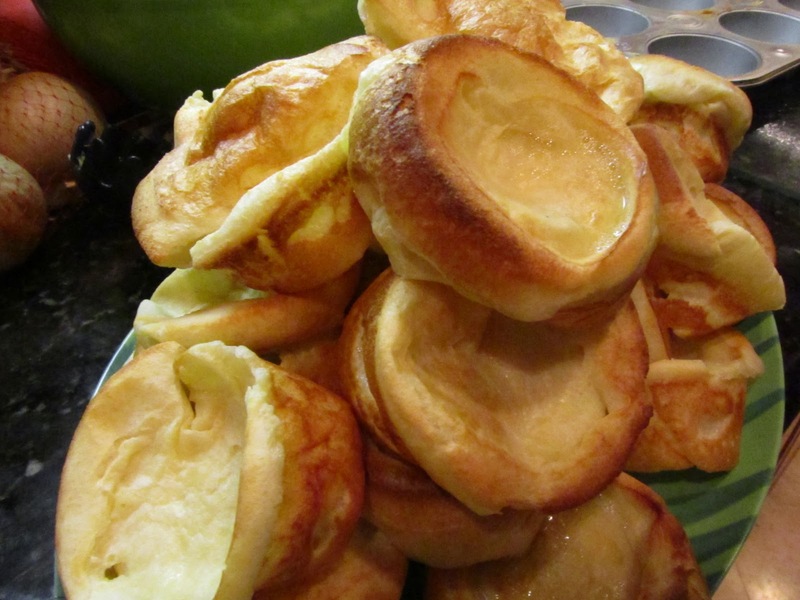 I did return back to the table several times to eat more roast beef, turkey and of course, the Yorkshire pudding. There were other dishes I didn’t take a photo of, but if you take a look at the spread, there is a lot of food and for the meal to have been cooked by one person — that’s serious kudos right there for ya! I’ve made meals like this before and I know how much work goes into it, so I am SO very appreciative when someone cooks a meal like this for me. Thank you Paul and Cory for yor hospitality and thanks for including me in your Christmas festivities! !